For custom butchery service and advice, trust the experts. Behind every Food City meat counter, you’ll find much more than a meat cutter. 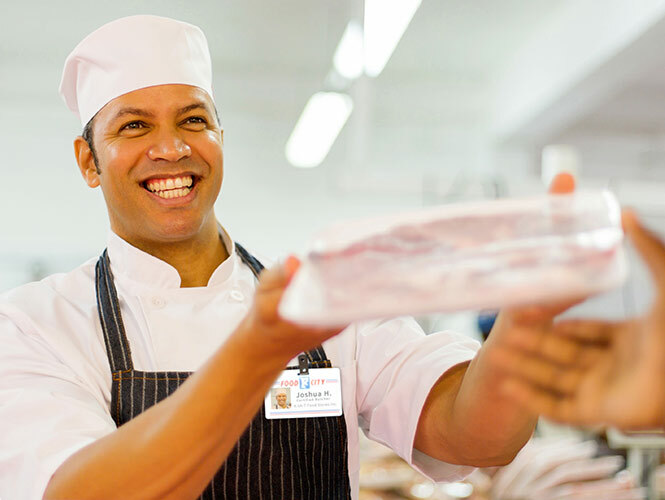 Each Food City Certified Butcher is a highly trained professional, ready to offer you a wide range of services. Whether you’re interested in custom cuts, special orders, distinctive marinades, shrimp and seafood setups for your grill, meat substitution ideas or even entire meal recommendations, all you need to do is ask. We’re betting you’ll be glad you did. Food City: Your source for the freshest meats and seafood. In the mood for shrimp but short on time to peel, devein and steam it? Want to throw in a few crab legs and a lobster before we crank up the steamer? We’ve got you covered on all counts. Curious about our 31 customizable options for magnificent meat marinades and seasonings? How about a vacuum tumble to tenderize your selection and seal in flavors? Want to chat about meat substitutions and meal planning? Step right up and get the details. It’s all free, and it’s all right here. We love visiting with our customers and helping them create masterpiece meals. Meet Brandon, your Food City Certified Butcher. Based in Johnson City, Tennessee, with 15 years of experience as a Food City Certified Butcher, Brandon D. is passionate about specialty roasts, which is why he’s proud to work at the only store in town offering Certified Angus Beef®. Brandon loves chatting about meats and marinades with customers and making helpful suggestions, especially about the perfect way to grill steaks. Ask Brandon for his favorite spicy, savory seasoning recommendations for your next meal. Looking for fresh fish? Look for bright scales and clear eyes, unless you’re looking at walleye, or other species with naturally cloudy eyes. When in doubt, ask! Avoid browning, yellowing scales, and look for firm, elastic flesh with a mild, non-fishy smell. If you’re looking at frozen fish, packaging should be tightly wrapped and odor free, with no dark or dry spots on the scales. In search of the perfect shellfish? Most of your worries can be alleviated easily by buying your catch from a reliable vendor like Food City. Live shellfish are of course the freshest available and should be moving around with hard, closed and undamaged shells. Lobster tails curl when they’re lifted from a tank, and oysters, clams, mussels and scallops close their shells when disturbed. Once they’ve been shelled, these should be found in clear water with a slight sheen. A versatile favorite in coastal and inland locations worldwide, shrimp is sold by the pound or by the size, either with or without its head, raw or peeled, steamed in its shell, steamed and peeled, or in some combination of these options. Raw shrimp should be gray and white, turning a pinkish orange when cooked. Always make sure your shrimp is deveined, fresh, clean and on ice.